The Befores and Afters theme kicks off with a slightly unusual and not very frequently made recipe. This dish also has the ability to switch forms from a ‘Before’ to an ‘After’: depending on whether you choose to make the sweet or the savoury version. The sweet tooth won this round, but of course! Appe (pronounced ‘Up-pay’) are small, sweet and very moreish. They resemble doughnut balls or the Danish pancakes aebleskivers (they are also known as paniyaram in southern India.) and taste like dense pancakes. Traditionally made for a range of festivals in most Pathare Prabhu homes, ours traded these for milk based desserts that are sweeter and far richer than appe. But, given that they were my childhood favourites and not made as often as I would have liked, I thought I owed them a mention here to let them enjoy their spot in the A-Z hall of fame. These appe get their distinctive look from being cooked in a cast iron pan that has 6-12 hemispherical compartments, depending on the size of the pan. Heat a cup of water till it is warm. In a large bowl, add all the semolina and pour the warm water over it till the mixture is the consistency of thick porridge. Cover and leave this to soak for about 2-3 hours. To this mixture, now add the sugar, cardamom and nutmeg powders and raisins. Give it a nice stir. Heat the appe pan as you would a normal frying pan. Add a few drops of ghee into each compartment. Spoon in the batter and fry till cooked, flipping each of the appe over and until you have a golden crust. Sprinkle some chopped nuts over the batter just before the appe are completely done. You can also make a banana version. Mash in a banana into the semolina mix and cut down on the sugar. This is a taste and proceed process and depends on how gooey you want the insides to be. You will also need to use more ghee to cook this version. 3. I chose to make a healthy option with very little ghee. You can choose to deep fry these too. 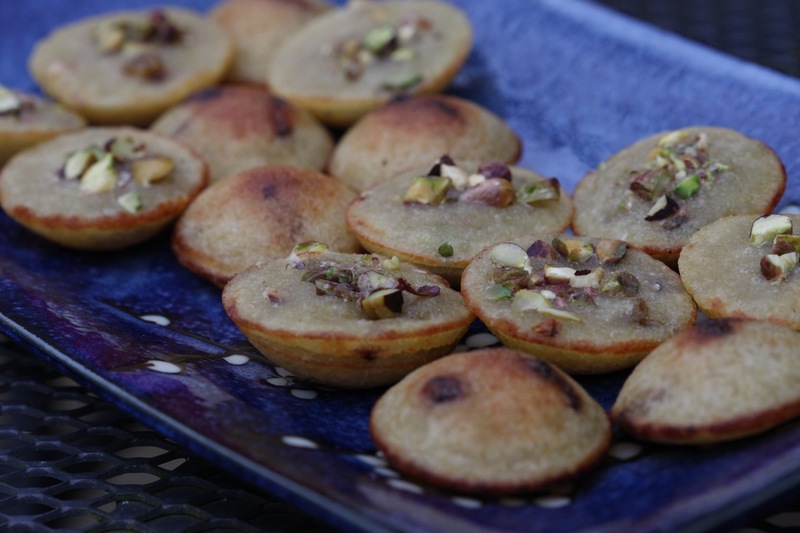 This version uses semolina which makes them denser and a perfect accompaniment for an after dinner coffee. I also chose to not to add a raising agent which explain the hemispherical shape you see here. If you don’t mind the taste, add a pinch of baking soda and they will puff up like little balloons. 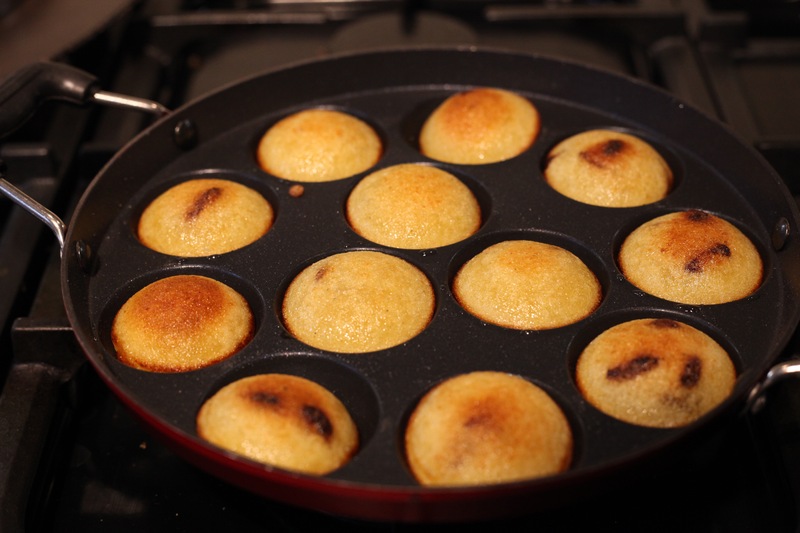 This entry was posted in A-Z 2016, Desserts, Festive food and tagged #AtoZchallenge, aebleskiver, appe, epicurious, ghee, Mumsnet Blogging Network, paniyaram, pathare prabhu delicacies, Pathare Prabhu recipes, semolina, Yummly. Bookmark the permalink. Yes, these are pretty easy to make and I love paniyaarams 🙂 In Kerala, we make another version called Unniyappams. That’s my all-time fav! Good luck with the challenge! Thanks, Shalini. Look forward to catching up with your blogs. Can’t believe you’re doing two this April. Good luck and enjoy! These look yum Monica 🙂 I am sure I have eaten these made by my mangalorean co-sis…and then there are savoury versions too. Thanks, Sunila. I am discovering that everyone is familiar with this dish by another regional name or in a regional avatar. 🙂 I like the savoury ones but these sweet semolina ones are my favourite. Look forward to catching up on your posts. Oh these are like those egg pancakes, pretty famous in Hong Kong. Didn’t know there’s a version in India too. Looks delicious. the pan looks similiar to my great-grandmother’s pan. i can’t remember the name of it though. hmm, it was cast iron, and the thingys had a Danish name. sigh. a delicious beginning to a to z. looking forward to more. Thanks for stopping by, Djinnia. Do you mean the aebleskiver pan? This is very similar. 🙂 Fascinating, isn’t it.